Two palettes for the price of one. 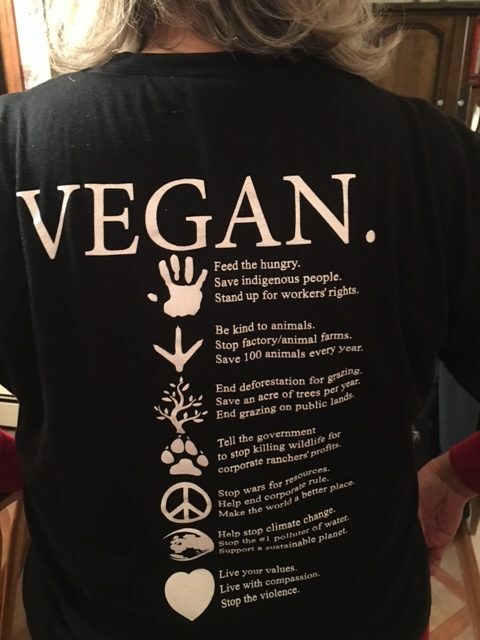 Yesterday was the front of my t-shirt; and today, let’s take a look at the back. This t-shirt is definitely one of my favorites, if not my all-time fav. I love how it boldly states that I am VEGAN, and then uses widely-recognized symbols to draw your attention to six important aspects that, for me, really speak to the reasons why I am vegan. Isn’t it absolutely grand? Love it! Each is its own snippet that can generate a lively and expansive conversation that you can tailor to the individual/group you are engaging with. 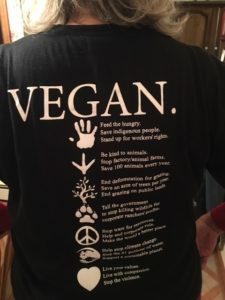 I wore this T-shirt last week at the grade school tabling event; and I have to tell you that it did, in fact, generate more than several comments which were conversation openers, especially given recent events both widely covered by media and others that are equally important but barely given any media coverage. It was easy to adjust the information to age-appropriate educational advocacy since the audience was a very mixed group from preschool, to grade school, to high school, to adults. 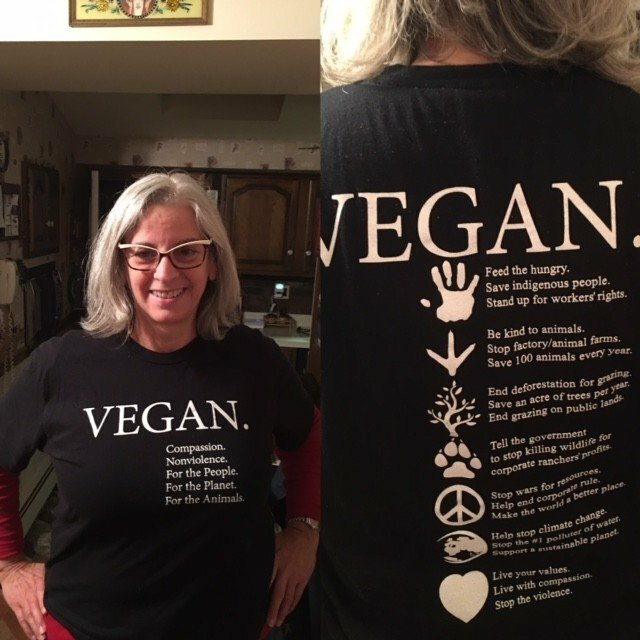 It’s fun to wear vegan-messaged attire. Be confident that when you choose to do so, you will be approached and queried. So, here’s my suggestion. Whatever message you decide to promote through your attire, be knowledgably conversant regarding what that message means to you (and to the plant, to the people, to the animals) and confidently engage to articulate express the information. You’re welcome. I LOVE my shirt!